Doors are what we do. And not just any doors, but doors that go beyond standard. We pride ourselves on providing doors with commercial grade components consistent with architectural specifications. In addition to being commercial quality, our pre-assembled doors are field friendly. The built-in adjustability provided by the hinge set screws is unique to PDL. 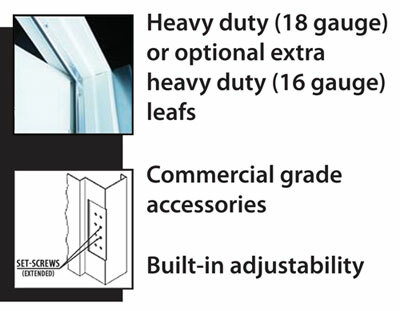 When the sill isn’t perfect, the girt alignment is slightly off, the door isn’t perfectly plum and square, or some other field condition exists affecting the operation of the door, these set screws allow for adjustment to ensure the door can operate properly. We also offer specialty door products and door canopies.